I’ve been very tempted recently by the Nintendo 3DS XL. There are just too many good games on that system to ignore and, as a Zelda junkie, A Link Between Worlds may well be the tipping point. 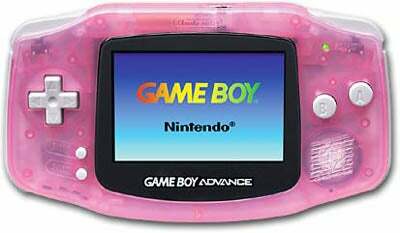 When I was pricing the system I discovered that they offer a pink version and it made me think back to my old Game Boy Advance. In a time before the Internet I ordered my video games from a mail order company called Gameplay. They’re defunct now and I’m sad to see they don’t even have a Wikipedia entry. The catalogue had a picture of the Arctic (clear blue) GBA with the other colours listed alongside, text only, and some explanation of the more esoteric names. When I called they said the only one available was “Fuchsia”, listed in that catalogue as “Fuchsia (Clear Red)”. I said that was fine.